As the end of the month approaches there isn't much news to pass along and this is especially typical at the end of Summer. However September is always a crazy month! We already know of two credit cards that will have increased sign up bonuses, the launch of a new suite of co-branded credits cards and we're guessing there will be even more news over the next few weeks. Sometime ago we brought you the details of National Bank of Canada's World Elite MasterCard which was has strong initial offering but that has now been made even better. The card that comes with a 30,000 point sign up bonus, up to $250 in airine fee coverage now has a first year free offer that waives the $150 annual fee if you apply by October 31st. Find out more here! 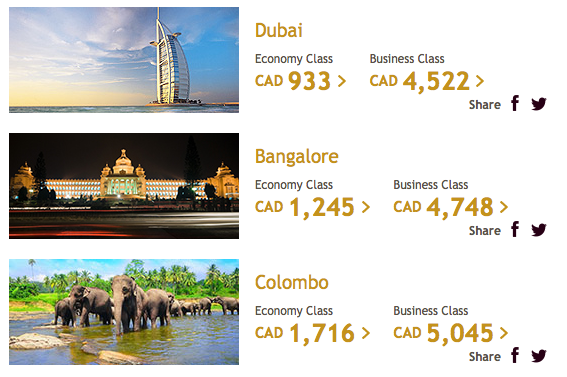 Etihad Airways has launched a 96 hour sale on their flights out of Toronto. Book by August 31st for travel until Dec 10 and save up to 30%. Find out more here.